A nicely-put piece by Tom Chiarella in Esquire. 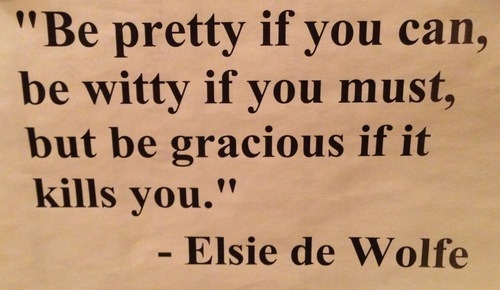 Is “gracious” the right word? Perhaps not, gracious is…polite. I’d perhaps go for interested or something. Doesn’t matter, the message works either way. Graciousness looks easy, but of course it is not. Do not mistake mere manners for graciousness. Manners are rules. Helpful, yes. But graciousness reflects a state of being; it emanates from your inventory of self. Start with what you already possess. You, for instance, have a job. Live up to that. On the street, in the lobby, square your shoulders to people you meet. Make a handshake matter — eye contact, good grip, elbow erring toward a right angle. Do not pump the hand, unless the other person is insistent on just that. Then pump the hell out of their hand. Smile. If you can’t smile, you can’t be gracious. You aren’t some dopey English butler. You are you. Remember that the only representation of you, no matter what your station, is you — your presentation, your demeanor. You simply must attend. Stand when someone enters the room, especially if you are lowly and he is the boss, and even if the reverse is true. Look them in the eye. Ask yourself: Does anybody need an introduction? If so, before you say one word about business, introduce them to others with pleasure in your voice. If you can’t muster enthusiasm for the people you happen upon in life, then you cannot be gracious. Remember, true graciousness demands that you have time for others. So listen. Be attentive to what people say. Respond, without interruption. You always have time. You own the time in which you live. You grant it to others without obligation. That is the gift of being gracious. The return — the payback, if you will — is the reputation you will quickly earn, the curiosity of others, the sense that people want to be in the room with you. The gracious man does not dwell on himself, but you can be confident that your reputation precedes you in everything you do and lingers long after you are finished. People will mark you for it. You will see it in their eyes. People trust the gracious man to care. The return comes in kind. Makes a change from “no trainers no hats no t-shirts”. Boris is clearly missing a trick with his public information. We need better tube posters. 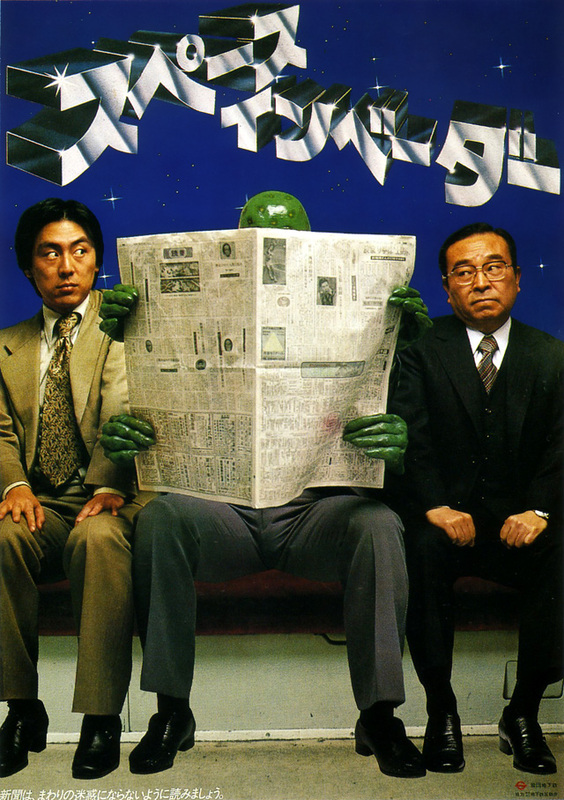 Here are a few etiquette posters that appeared in the Tokyo subways between 1976 and 1982 (more at the original post, via Pink Tentacle). 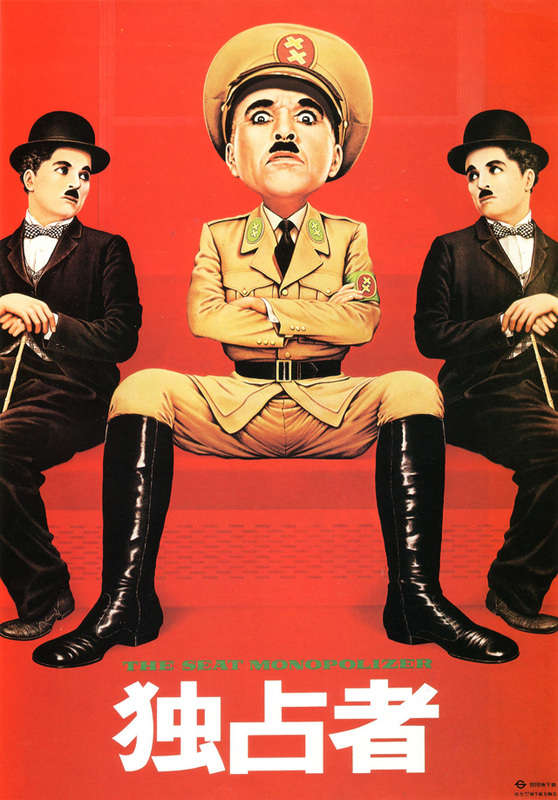 Inspired by Charlie Chaplin’s “The Great Dictator,” this poster tells passengers not to sit like idiots. 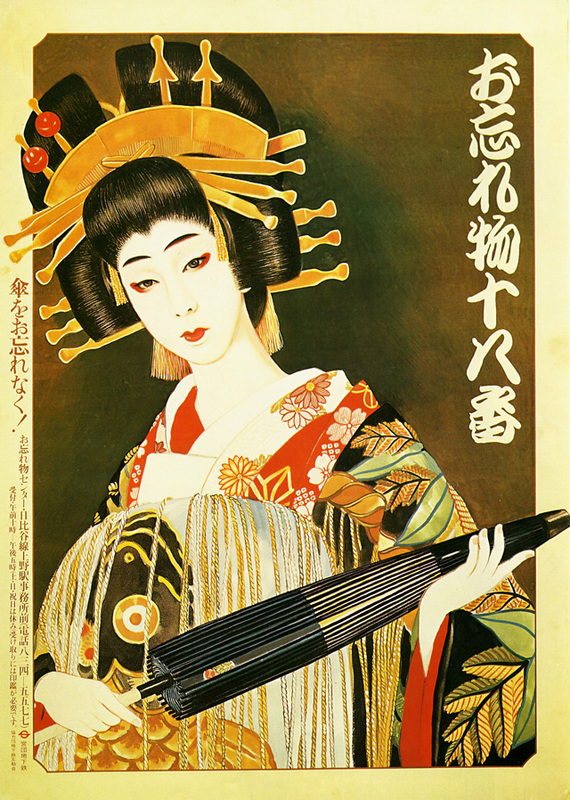 This poster of the high-class courtesan Agemaki (from the kabuki play “Sukeroku”), whose captivating beauty was said to make men forgetful, is meant to remind passengers to take their umbrellas when they leave the train. This 1979 poster has a fairly simply play on words. If you can’t work it out, I can’t help you. 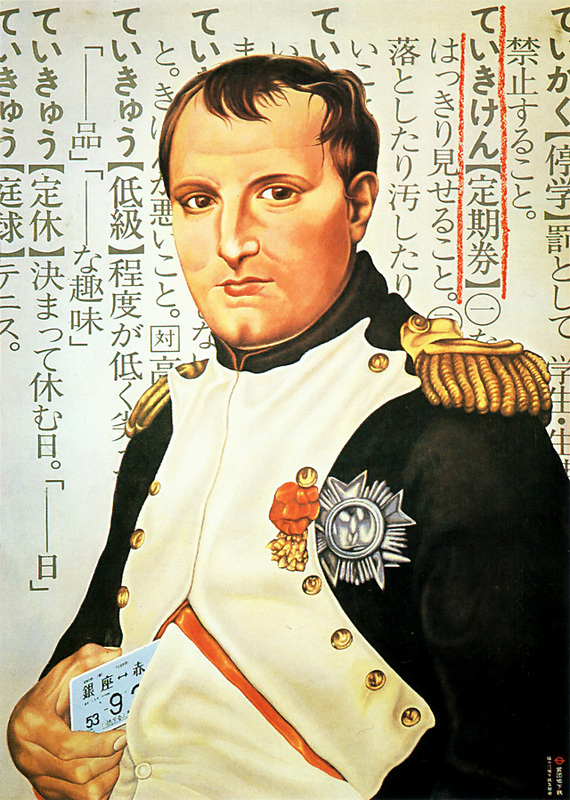 The text at the top of this poster reads “Kasane-gasane no kami-danomi” (lit. “Wishing to God again and again”). 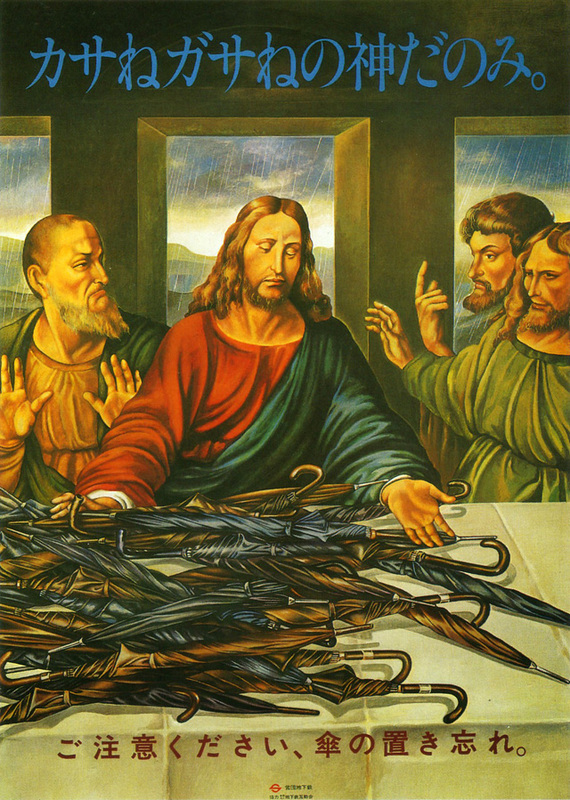 The poster makes a play on the words “kasa” (umbrella) and “kasane-gasane” (again and again). Doubting Thomas looks pretty freaky. 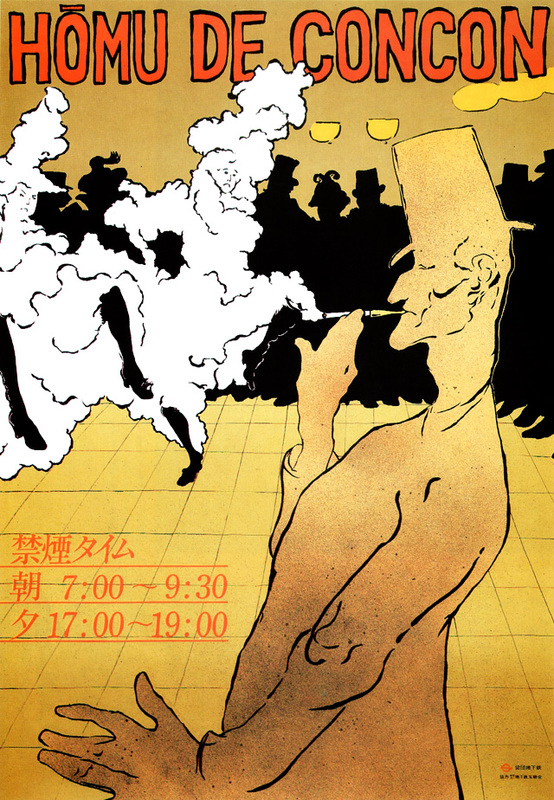 Modeled after the paintings of Henri de Toulouse-Lautrec, this poster — titled “Hōmu de Concon” (coughing on the platform) — urges people not to smoke on the train platforms during the designated non-smoking hours (7:00-9:30 AM and 5:00-7:00 PM). The poster makes a play on the words “concon” (coughing sound) and “cancan” (French chorus line dance). 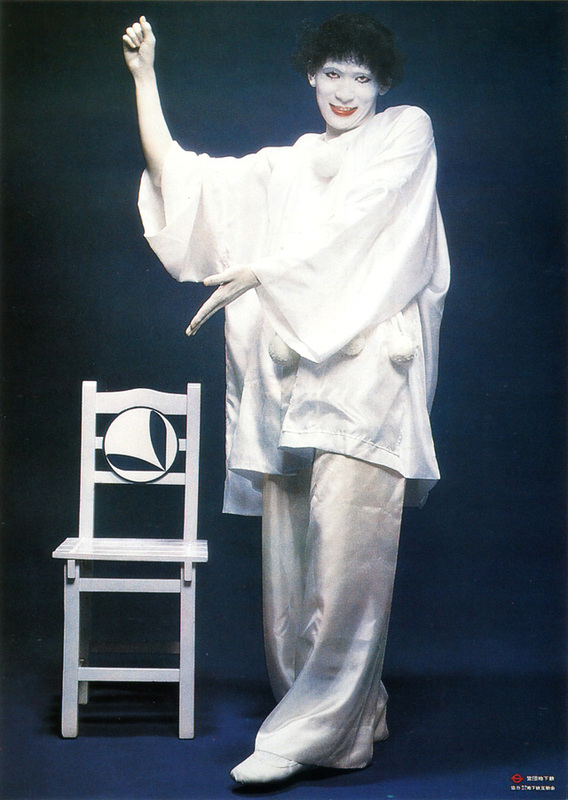 Marcel Marceau gestures toward a priority seat reserved for elderly and handicapped passengers, expecting mothers, and passengers accompanying small children. He makes me afraid of clowns. And that, my friends, is how etiquette videos should be done. This came from the Scott Adams blog (Dilbert). Read on – you might learn something. A few of you wondered what I meant by active listening in the context of a conversation. Maybe you want to be a good listener without being bored out of your frickin’ skull. I’ll tell you how. Neighbor: My wife got me a new grille for my birthday. That’s just being a jerk. Active listening, as I choose to define it, involves asking questions to steer the conversation in an entertaining direction without being too obvious about it. Using my example, let’s say you have no interest in hearing about the wonders of barbecuing, but you don’t want to be a blatant conversation hijacker. You might steer the conversation thusly. You: Does that mean you do most of the cooking now? Neighbor: Ha ha! Yes, I think it was a trick. You: If you do the cooking, who does the dishes? Neighbor: Well, usually the one who doesn’t cook does the dishes. You: Do you enjoy cooking? You: Your wife does. So you’re getting screwed when she does the cooking and you do the dishes because she enjoys her end of it. Okay, maybe in this example the conversation will lead to your neighbor getting a divorce. As a general rule, the more dangerous or inappropriate the conversation, the more interesting it is. You’ll have to use your judgment to know when you’ve crossed the line. Also as a general rule, conversations about how people have or will interact are interesting, and conversations about objects are dull. So steer toward topics that involve human perceptions and feelings, and away from objects and things. You also want to avoid any topic that falls into the “you had to be there” category. For example, if someone is describing a vacation, avoid asking about the food. Nothing is more boring than a description of food. Ask instead if the person answered email from the beach. That gets to how a person thinks, and how hard it is to release a habit. And it could provide an escape route to move the conversation to yet another place. Sometimes it takes two or three bounces to get someplace of mutual interest. You’ve heard of the Kevin Bacon game, where every actor is just a few connections away from Kevin Bacon. Likewise, you almost always have something interesting in common with every other person. The trick is to find it. As with the Kevin Bacon game, you’d be surprised at how few questions it takes to get there. 2. Have you driven anyone famous? I heard amazing stories of political exile, rock star antics, and war. It was great stuff. Most people have at least one good story in them. And you can usually find that story by asking where the person lived and what their parents did for a living. Watch how this works. If you leave a comment, mention where you grew up, and what your parents did for a living. Notice from the other comments how often at least one of those things is interesting or has a connection to something you care about.